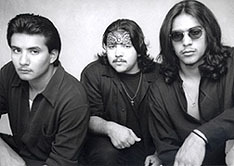 No doubt, Los Lonely Boys come from a very talented musical family. They grew up in relative poverty in the heart of west Texas, San Angelo to be exact. Their father, along with five brothers and a sister formed a Tejano or conjunto band and played throughout the Southwest. Upon the death of one of the brothers, they disbanded. Later, the “Boys” began to accompany their father at gigs; soon Da Boys started playing as a trio. Their first gig without their father was in Atlanta, GA. They lived and played in Nashville learning about the music industry and playing whenever possible. They eventually became noticed by people in the music industry, most notably radio station KGSR-FM in Austin, TX. One day, Jody Denberg, program director for KGSR, was playing one of Da Boys songs prior to a show that evening. Da Boys were driving in to Austin for the gig. Apparently, they pulled over, called the adult, alternative, Americana, singer, songwriter, station in tears at hearing themselves on the radio for the first time. Willie Nelson was so impressed with them, that he allowed them to record their first album at his Pedernales studio. Their rise to stardom had begun. On Sunday, May 9th(Mother’s Day), I spoke with Jojo Garza (bass player) of Los Lonely Boys. I was understandably quite nervous about doing my first phone interview; however, Jojo made me feel at ease. Once I got over my jitters, I was able to settle down and conduct a twelve minute interview with him. He advised me to “ be cool and think before I speak," and despite a couple of awkward moments, he and I were soon talking about two things we are both very passionate about: God and music. The Boys have several obvious influences such as Carlos Santana, Stevie Ray Vaughan, and Jimi Hendrix. Some of the less obvious ones were Freddie Fender, Flaco Jiminez, and Augie Meyers. His dad grew up with the latter three, and the end result is a Texican-style trio of rock, soul, tejano, maybe even a tinge of country. The family influence is strong in the music of the three Garza brothers. Yet, there is an even greater influence in their lives. “God is the source of all power, He is our leader," Jojo proclaimed. “God blessed us with talent, and it is He who is playing through us---not just the Garza brothers.” In today’s music industry, that is a humble, yet powerful statement. I could feel the sincerity and passion in Jojo’s voice as he was telling me this. The band has definitely paid its dues, and as Jojo said, “We have paid a second set of dues, dues that belong to other people!” As their single “Heaven” continues to climb the charts, how appropriate it is that this song is the first one to be heard on corporate radio. Their lyrics, “I just keep on praying Lord, just keep on livin’, how far is heaven?”, seem to explain Los Lonely Boys philosophy about life. It is a positive, yet powerful statement about how God is the center of their lives. They are trying to use their talent for God’s will; perhaps that is why they are connecting so well with their audience. In all their songs, you can feel the influences of many great teachers. Instead of sounding like a copy of their album, the band stays “fluent” and continues to learn and grow as musicians. I saw them live last December at KGSR’s 13th. Anniversary Party, and they are real musicians. Not a production. They “reach for the soul”, not the “pockets (wallets or purses)” of their audience. This sets them apart from most performers in the music industry and makes them truly artists---not just performers. They write their own lyrics and music, along with help from friends such as Phil Roy. They plan to “completely expand”, to be a “big ocean of music, flowing water…” For now, they are certainly continuing to grow as musicians. Their first album, which I’ve been listening to for months, is brand new to most of their audience. I hope to see them again either at Stubb’s here in Austin (in July), or at the Austin City Limits Music Festival (in September). Los Lonely Boys is a great musical representative of the Lone Star state. I can’t wait to see how long and how bright their musical star will shine. With their own family, and as part of God’s family, they are part of a larger family of very talented and gifted musicians.